Heat oven to 350°F (325°F for dark or nonstick pan). Place Reynolds Baking Cups in each of 24 regular-size muffin cups. In heavy 8-inch nonstick skillet, cook pecans and 2 tablespoons of the sugar over low heat about 8 minutes, stirring constantly, until sugar is melted. Spoon and spread pecans onto sheet of waxed paper. Sprinkle with remaining 1 tablespoon sugar; toss. In large bowl, beat cake mix, pumpkin, water, oil, eggs and pumpkin pie spice with electric mixer on low speed 30 seconds, then on medium speed 2 minutes, scraping bowl occasionally. Divide batter evenly among muffin cups (about two-thirds full). Bake 19 to 24 minutes or until toothpick inserted in center comes out clean. Cool in pans 10 minutes; remove from pans to cooling rack. Cool completely, about 30 minutes. Frost cupcakes with frosting. 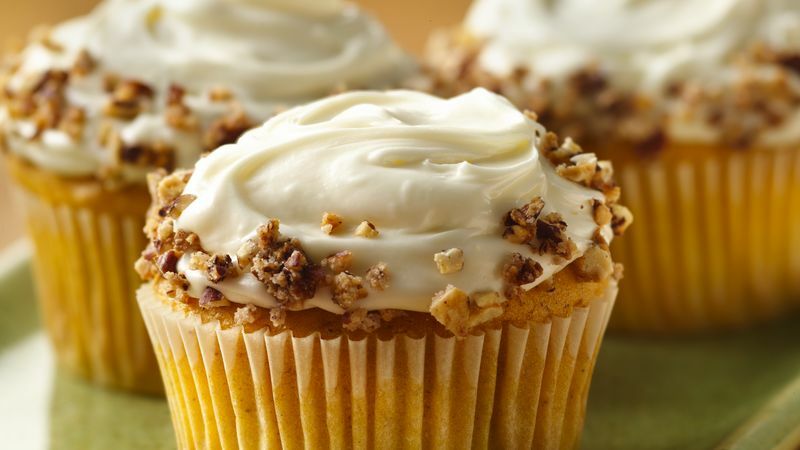 Sprinkle edge of frosted cupcakes with pecans; press lightly into frosting. Store loosely covered. Reynolds StayBrite Baking Cups are fashion-inspired designs that won’t fade during baking. Use a heavy skillet, low heat and a constant eye to cook the sugar and nuts to ensure no burning.